The best way for us to show you our website options is to show you actual completed examples. These websites are live and currently in use. 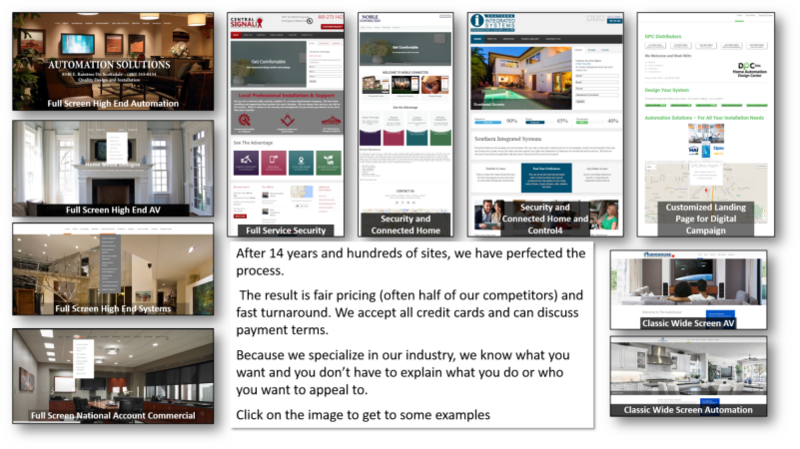 Below are just a few dozen examples of the completed websites. These sites are specifically designed for the “Connected Home”, Security, and Residential Integration industry. Our process is to understand your company and what you provide to clients. We then customize and coordinate your site to fit your company needs. There are no extra costs or upgrades. Slideshows, maps, forms, drop down feature highlights, product pages, and text areas all come included in the purchase of your site.